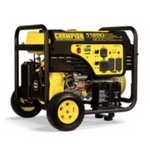 Champion 9000-Watt Generator | Florida Farm & Feed, Inc. The Champion Power Equipment 100203 9000-Watt Portable Generator is designed with your safety and convenience in mind. A cost-effective solution that delivers power and peace of mind, this generator will provide all the backup power you need for power outages and emergencies. For projects, the 459cc Champion single-cylinder OHV engine has what it takes to handle the multiple power tools and large equipment you need to get the job done. At 11,250 starting watts and 9000 running watts, this unit can handle it all in an outage – lights, refrigerator, modem/router, security system, window AC, furnace blower, TV, computer, phone charger and more. Not only that, but the Volt Guard™ built-in surge protector prevents overloads and keeps your equipment safe from spikes in voltage.